I have always loved going to museums. The Milwaukee museum is known, or at least I know them, for their excellent dioramas. They are all made on site and they had their own in house team of designers and sculptors who would build out these detailed and rich scenes. As a kid, and if I am to be honest, as an adult I can get lost in these. I let my imagination run wild in them. I can hear the sounds of the eagle soaring up above and can almost feel the cold winter snow on my skin as I walk through the Inuit village. The realism comes from attention to detail. For me, the feeling is a palpable one. I am transported and I want to bring that same sensation to my classroom. How do we start building a palpable experience that transports our students into a different time, place, or event? Well, what I have found works the best is props. Think about your school's play or musical and the work and detail that goes into their stage production. With some effort and imagination that little bit of effort transports the audience. We need to think of ways that we can "dress up" our activities. I did just that on my latest simulation in world history. While studying the Dark Ages I wanted to have a simulation that would really surprise students. As a history teacher, there are always cool simulations you can do with war or financial trading. However, when it comes to some of the other parts of history there is little to know experiential learning. This unit, I built a simulation around the concept of making illuminated manuscripts by monks. We had talked about their importance the day before and gave them many visuals for them to get accustomed to the idea of an illuminated manuscript. Today, they entered a very different room then they are used to in world history. They would be confronted with several props or intentional decisions to make the simulation more immersive. Second: Light was only cast by the flickering of candle light on their desks. I bought some cool LED digital lights on Amazon (LINK: I liked these a lot they look real and worked great). This was a big wow by students. They loved seeing the waving lights of the candles. Third: Another source of light and fun pretend play was a 5 hour long HD video of fire in a fireplace, including crackling noises. This was free and worth every penny. I had that displayed on our front screen and often referred to it with students. I asked one who was sitting close if he had to move as he might be getting hot. Forth: Throughout it all, I was playing a Gregorian chant playlist. This added to the depth of the simulation. You could really see students working and focusing throughout the entire simulation. Before they entered class, all the students had to take a vow of silence. Throughout the class I referred to them as Brother Marcus and Sister Abby. A smile always went across their faces. Looking out over them, diligently working, focusing hard at transcribing their documents, it was clear to me that I was no longer in a classroom in Wisconsin. I was transported with my students and the power of pretend play to an Italian monastery in the foothills of the Apennines. 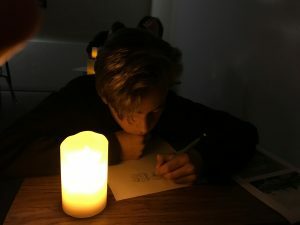 Building immersive and palpable experiences can really change up a class activity. With simple additions and a little creative leap, anyone can be transported. Take the leap with me and your students and lets see where you end up.